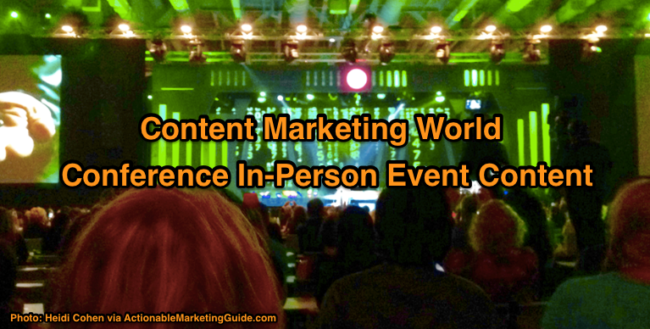 Conferences like Content Marketing World are the ultimate in-person event content. Presenters, attendees and sponsors must engage person-to-person (P2P). Human-to-human (H2H—Hat tip: Bryan Kramer) interactions build relationships that continue to grow. I learned you must reveal your true inner self through your content at a live event like Content Marketing World. To succeed at conferences, you must be naked and exposed. Joe Pulizzi kicked off Content Marketing World 2016. 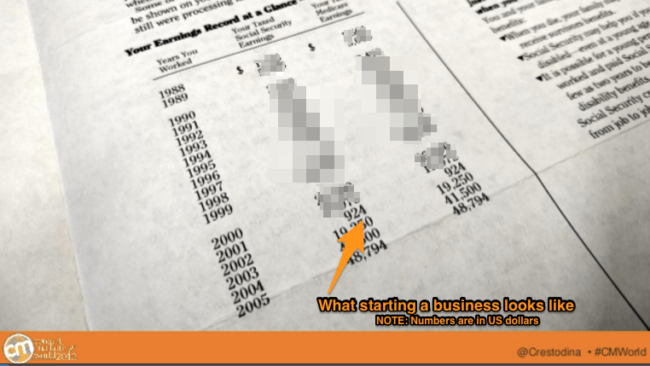 He set the agenda by exposing his personal entrepreneurial experience. Before becoming the godfather of content marketing, Pulizzi started Junta42 in March 2007. By September 2009, Pulizzi realized he failed. Pulizzi didn’t totally commit to content marketing. So he pivoted. He went all in on Content Marketing Institute. Result:Content Marketing Institute sold to UBM for $17.6 million in May 2016! While Pulizzi looks like an overnight success, it took 9 years to achieve this goal. MarketingProfs’s Ann Handley dubbed this “slow marketing”. 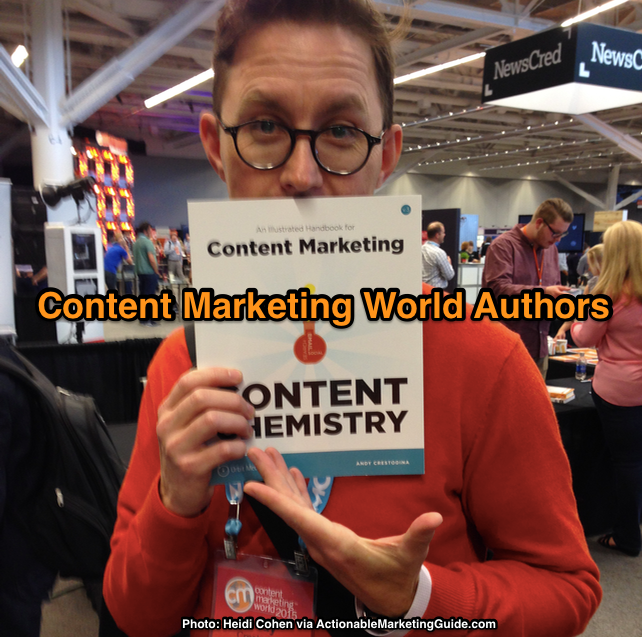 Orbit Media’s Andy Crestodina gave the 2016 Content Marketing World keynote. Talk about ultimate in-person event content! This is a mega platform and the pressure’s on. You can’t pay for it. You must be the best-rated speaker of the previous year’s conference. Your audience has to show you real love in their feedback. You must create in-person event content that listens to your audience’s needs. Content Marketing World attendees are a very savvy, discerning group. Running $10 million Orbit Media agency, Crestodina looks like an overnight content marketing success. Crestodina showed his humble beings. In 2002, he earned $924. That’s it. 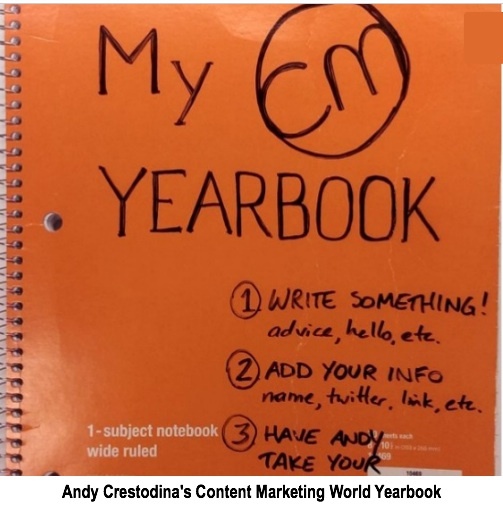 Crestodina grew and evolved as a content marketer. In Chicago he creates in-person events. He runs a monthly Wine and Web after work and an annual full day Content Jam. This provides additional content and presenting experience. Further, he’s built his website, blog and email list. He consistently posts once every other week on the Orbit Media blog. He also guest posts to support his search optimization and expand his reach. Ask: “How can we be fully committed to a true content marketing strategy?” How do we have to modify our business goals? What does this mean for our audience? Engaging with influencers, peers and prospects is a key element of any in-person live conference event. The most important element of in-person event content is building an on-going community. Pulizzi and his CMI team have done right. It’s not just a once-a-year conference. Content Marketing World celebrates its loyal participants. Specifically, they call out those who’ve attended every year. These fans are on the Content Marketing World Hall of Fame. To be included, you have to show up! That’s core to being part of any community. Here’s a photo of Deana Goldasich. 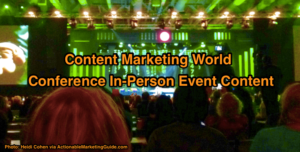 She’s attended Content Marketing World every year—6 years in a row! This year she presented her own session! 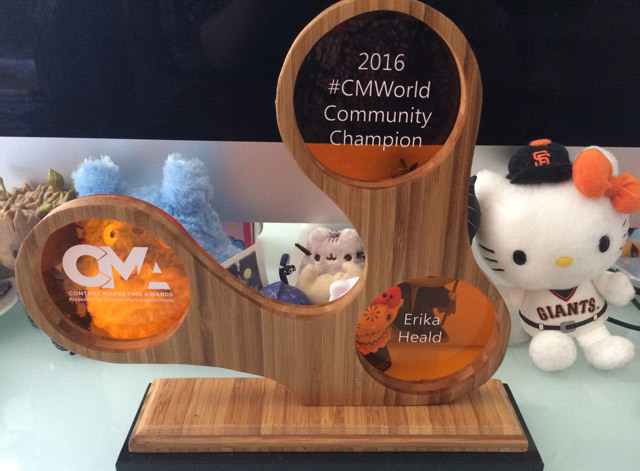 This year, Content Marketing Institute recognized Erika Heald as its 2016 #CMWorld Community Champion at its awards ceremony. The best part: Heald was celebrated on Twitter where she’s the #CMWorld queen! This is a great way to show your community they matter to you. Consider how you can spotlight your community members. Remember: Your goal is to make them feel important, not to push your products and services. In 2015, Content Marketing Institute introduced their not-for-profit, The Orange Effect Foundation. 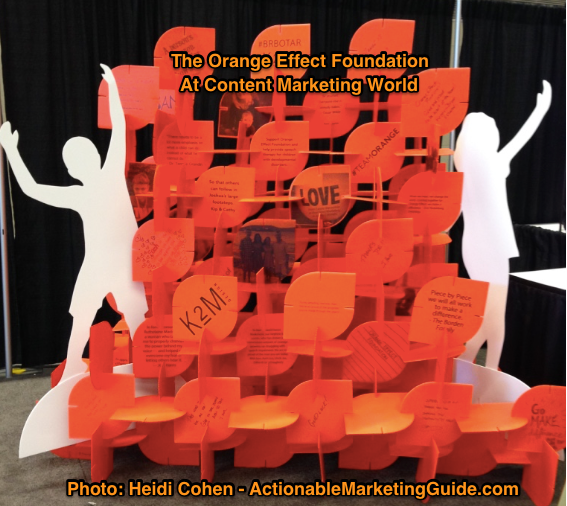 There was a jumbo orange cube composed of smaller cubes on display to get Content Marketing World attendees involved. Pam and Joe Pulizzi founded The Orange Effect Foundation. Its mission is to help developmentally disabled children find their voices. The Orange Effect Foundation walks the talk. In an intimate video Pam and Joe describe their personal journey with their son who was born with autism. They discovered early intervention helped significantly. It enabled their son to become an independent young man. Talk about being naked and exposed. How many parents would step outside their comfort zone to help others in need? Yet, the Pulizzis did. Not only Pam and Joe but also, their son. The Orange Effect Foundation is on topic. They know their audience because they’ve been there. The Orange Effect Foundation offers #CMWorld attendees a way to give back as a communications savvy community to those who need help communicating. BTW–If you want to help the Orange Effect Foundation, please make a donation. Think about how your organization can give back to your community. Ask: What kind of content can we create to support this initiative. Regardless of your role, speaker, attendee or sponsor, at a live in-person conference, you must engage with the people there. It’s your opportunity to build real-life relationships with others. These bonds can grow and translate into online opportunities, both business and personal. You’ve got to be willing to participate. You need to turn off your devices and exist in the moment. Be your true self. You need to find a way to make a connection. At Content Marketing World, I was fortunate. I met amazing people. Readers came up to me. They told me they read my blog. I had dinner with new people each night. We built connections within the larger Content Marketing World community. I had the time to learn more about people I’d met at earlier Content Marketing Worlds. We discussed ways we can work together going forward. Are you willing to make your in-person event content naked and exposed to reveal your true self? Can your in-person event content connect better with your core community? What one small step can you take now to build for the future? How about if you share this article with your community? Photo Credit: (c)2016 Heidi Cohen – Right to use with link to this article. Tags Andy Crestodina, Ann Handley, CMWorld, Content Marketing Institute, Content marketing world, Deana Goldasich, Erika Heald, Gini Dietrich, Joe Pulizzi, Orange Effect Foundation. Bookmark the permalink.